Finally got some powder on the mountain at Park City. And I was able to try out the new Armada JJ’s that Christy was so nice to bring out from San Francisco. After very little snow, we got a fresh 10″ or so overnight and I was out the door as soon as the lifts were running. Got a bunch of fresh tracks and finally found the courage to explore Jupiter Bowl alone. I know, sounds wussy-ish, but as it was slick and fast I did not want to take the chance of slipping off of something without anyone with me. Now with tons of soft powder it seemed tame. I spent some time in the trees and jumping down the steeps. I have to say these powder skis make all the difference in the world. They just float on top and carve nice and easy. It’s night and day compared to my other skis, which are not skinny by any stretch. Any way, good day. I have asked Mary to write a blog post, but since we’ve signed a contract to sell our house, she is busy with packing, moving, storing, selling, changing addresses and a host of other things. She is the busy ant to my grasshopper. 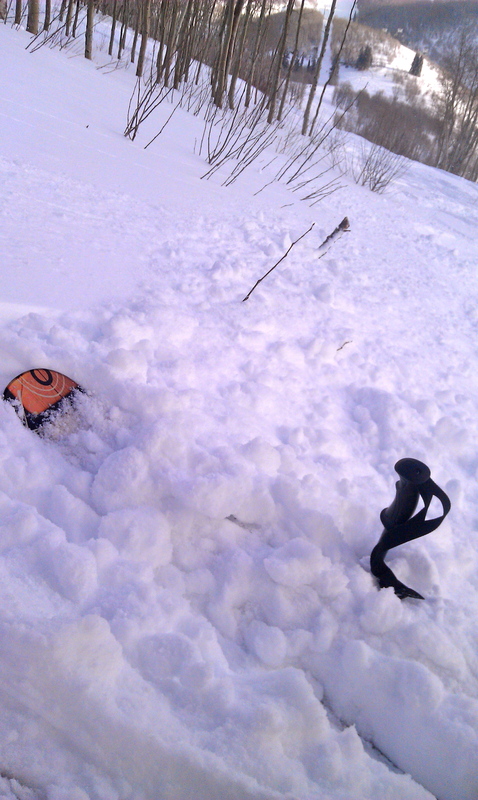 This entry was posted in Uncategorized and tagged Mal/Christy, skiing by Pete. Bookmark the permalink.